The Miami University Steel Band, directed by Chris Tanner, will perform at 7:30 p.m. Wednesday, April 15, in Hall Auditorium. The concert will feature special guests steel pan artist Dave Longfellow and saxophonist Jeremy Long, assistant professor of music at Miami. Longfellow is a member of the quintet the Dave Longfellow Ensemble, dedicated to creating new musical expressions involving steel pans and to spreading the beauty and versatility of these instruments to new audiences. 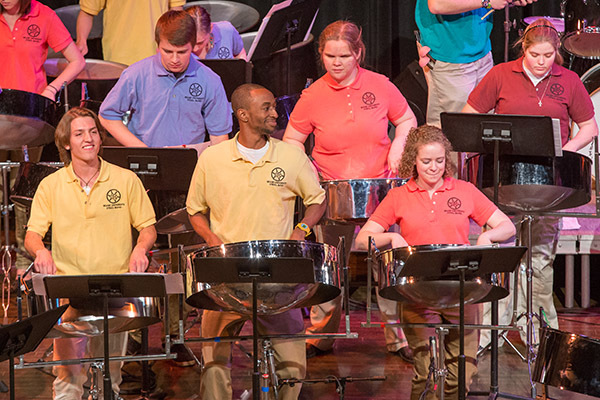 Longfellow and Long will join the Steel Band ensemble for an evening of original music featuring two new student compositions and compositions from both Longfellow and Tanner. Tickets, $5 students and seniors, $7 general, are available at the box office in Shriver Center.